The highest year-round passes, the highest Kirchdorf, the most spectacular railway line, the oldest murals in Europe – all this and much more is promised by Graubünden, the trilingual country in the heart of Europe. Archaic landscapes, age-old churches, pristine villages and promising paths often seem like a world unto themselves and combine to create a calming and stimulating experience. Our new journey invites you to discover the scenic highlights and artistic treasures of Grisons. In this sense: Allegra – benvenuti – welcome! Flight to Zurich. Drive to Chur: Walk through the old town with a visit to the former monastery church of St. Luzius with a Carolingian crypt and the reformed town church of St. Martin with glass windows by A. Giacometti. The reformed city church of St. Margarethen in Ilanz shows a wonderfully vibrant Gothic painting. Further up in the Rhine Valley, at the crossroads of the two mountain passes towards Oberalp and Lukmanier, lies the important monastery of Disentis, founded in the 8th century, today a mighty Baroque complex from the late 17th century. In the afternoon we are in Waltensburg / Vuorz: church with a significant cycle of frescoes by the "Waltensburger Meister" (around 1350). Then hike (2x 1 hour) through the landscape of the Surselva to the Casti Munt Sogn Gieri on the Jörgenberg, the most imposing and oldest castle between the Rhine Gorge and the source of the Rhine. Chur: In the morning opportunity to visit the church. Afterwards, a detailed visit to the Cathedral of the Assumption of the Assumption, with its superb architectural sculptures and rich furnishings (8th century). Free time, possibility to visit the Rhaetian Museum. An afternoon excursion takes you to nearby Rhäzüns with a walk (2 x 20 min.) To the fully painted high medieval church Sogn Gieri (St. Georg) and to the cemetery church Sogn Paul (St. Paul). Short drive to Filisur: walk through the street village with houses in Engadine style. Further down in the valley, on the road to Davos, lies Schmitten with its completely painted old church of St. Luzius (before 1000) on the church hill. 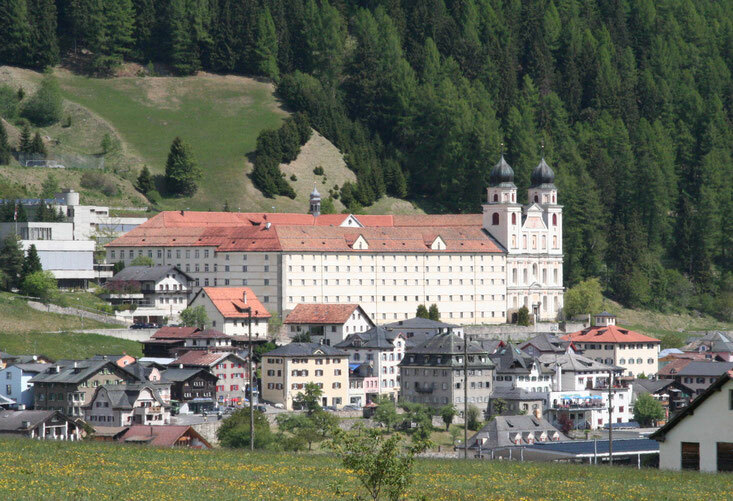 Return to Bergün: walk through the town past numerous listed buildings; A visit to the church richly painted in the style of the Italian early Renaissance. The afternoon is free. For pedestrians and art lovers there is the possibility of a hike (about 1 hour, alternative: Postbus) to the hamlet of Stuls / Stugl above Bergün: little church with a complete painting of the Giotto school. Via Filisur, Tiefencastel, Schynschlucht and Thusis we reach the once-feared Via Mala (possibility to descend into the gorge). From there it goes behind Andeer in the remote Avers to the highest church village in Europe, Avers-Cresta (1,958 m). After returning to Andeer, we see the significant graffiti decoration on Haus Pedrun. Completely adapted to the landscape is the small Romanesque church of Clugin with early Gothic painting. The artistic highlight of the day is the Church of St. Martin in Zillis with the most important painted wooden coffered ceiling in Europe (1130/40 or earlier); Visit to the museum dedicated to this work of art. A special experience is the two-hour ride on the Rhaetian Railway on the spectacular route between Bergün / Albula and Poschiavo / Puschlav, which overcomes two passes - Albula and Bernina. Poschiavo itself, picturesquely situated on a small lake, surprises with the two churches of San Vittore Mauro (around 1500) and the Baroque building of San Maria Assunta (18th century). Then you take the bus over the 2,328 m high Bernina Pass back to the Engadine to Pontresina to the old parish church of Santa Maria (with paintings of the 12th and 15th century), before we reach our next quarters on Lake Sils: Hotel reference for one Night. In the morning our way leads us to the beautifully situated in the landscape, archaic-looking church of Fex-Crasta above the lake Sils. In fashionable St. Moritz we see the museum of the Graubünden high mountain painter Giovanni Segantini, above all his magnificent alpine triptych "Be - be - offense". The landmark of Cerelina / Schlarigna is the church of San Gian with a Romanesque and Gothic tower, painted gothic wooden ceiling and murals of the Lombard early Renaissance. From there, our route leads us via Samedan and Zuoz with many typical Engadine houses, Zernez and the Ofen Pass (2,149 m) through the Upper Engadin National Park to the remote Münstertal valley to Müstair: hotel accommodation for one night. UNESCO's World Heritage site includes the Benedictine monastery of St. Johann in Müstair, the most important church from the turn of the millennium in Switzerland, with the largest surviving cycle of Carolingian murals, still influenced by late antiquity. Visit to the monastery museum. Then back to the Lower Engadine and continue on the Flüelapass (2383 m) past Davos through the Prättigau to Landquart. On the highway back to Zurich.